Momentum created from Clemson’s College Cup run in 2005 and a solid incoming recruiting class should mean another successful season for the Tigers in 2006. The media that follow college soccer feels that way as Clemson is a top five national pick in the preseason. Clemson returns 13 letter winners and seven starters from last year’s team that finished 15-6-3 overall and advanced to the Final Four of the College Cup and a number-three final national ranking. “We lost two great defenders in Justin Moore and Nathan Sturgis to graduation,” said Adair. “Last year we could build from the back and get the ball forward. If we can shore up the back we should be in good shape.” The two returning starters in the back are Havird Usry and Alan O’Hara. Harvird is a two-year starter and Alan is a leader and organizer in the back. We have a very good goalkeeper behind them in Phil Marfuggi. Phil was an All-American last year and he is without a doubt one of the top goalkeepers in the country. “As far as our attack, we have outstanding speed and scoring ability. David Bell and Dane Richards are the fastest soccer players I have ever coached.” That is quite a statement coming from Clemson’s mentor who has been a head coach since 1991. “We needed experienced players last year in our recruiting class. O’Hara and Richards made major impacts right away. Once Richards got in the swing of things he carried us. With our good defenders Justin Moore and Nathan Sturgis, it all came together. We got on track and I wasn’t surprised with how far we advanced. Even when we were struggling, I felt as if we were just as good as any body in the country. It took a while for us to get going last year, but a season is a marathon not a sprint. “I was happy with the way the team came together last year. We showed confidence and advanced to the Final Four when we were counted out early in the season. The strength of the ACC helped us prepare for the NCAAs. “All of the incoming players should have an impact on the season. A major key for us this year will be how quickly the kids in the back come together and gel as a unit. How quickly they sort things out and develop a strong working relationship. Goalkeeper Clemson returns All-American Phil Marfuggi (senior) in goal. Last year, he had a 0.85 goals allowed average and 89 saves. He was incredible in the postseason last year, a big reason Clemson did not allow a goal in the first four games on the NCAA Tournament. Scott Rossman (RS-Freshman) has made tons of progress and simply needs some games to gain the experience to play in the ACC. Defenders Clemson lost two starters in Justin Moore and Nathan Sturgis, both whom are playing in the MLS. Havird Usry (Junior) are back from last season and will lead this area of the team. O’Hara is a two year starter, and O’Hara started last season after transferring to Clemson. Usry started 22 matches last season while O’Hara started all 24 matches. “This is the questionmark, how do you replace two players who are in the MLS? O’Hara and Usry are our mainstays, and with their experience, we have something to build around. We do have a lot of people working to gain the starting roles. Parker Rogers (RS-Freshman), Greg Eckhardt (Freshman), David Newton (RS-Freshman), Micah Usry (Senior) and Tate also will be vying for starting roles. Midfield Clemson should be very solid in the midfield and has a solid corps of players returning with Bryson Moore (Sophomore), Bryson Moore had four goals and four assists as he started 23 matches. Moore earned All-ACC freshman honors last season. Mark Buchholz had five goals and three assists for 13 points. “These three players (Bryson Moore, Mark Buchholz and Hector Quintanar) are three players that have a lot of experience and will very likely start. What we are looking for this year is to be able to spring the forward through. We need someone to stay at home like Bradley Gibson (2005 senior) did and absorb some of the pressure and not leave the defense exposed. Buchholz is a strong player and Quintanar keeps the ball moving. Moore has great speed and can score goals.” Clemson added Paulo Bonfim from Sao Paulo, Brazil. According to the coaches, he is a good distributor and will solidify the midfield position. 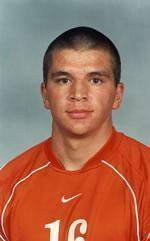 He can also play in the back if needed..
Forwards Clemson should be the deepest in this position since Adair took over at Clemson in 1995. Clemson has the leading scorer in 2005 back as Dane Richards returns for his senior season. Richards had 12 goals and eight assists for 32 points last season. The All-ACC performer started in all 24 matches and was named to the All-College Cup team. Clemson added Frederico Moojen, a 6-1 senior from Balneario, Brazil and David Bell a 5-10 junior transfer from Berry College.